The Beit-Alpha (Bet Alpha, Beth Alpha) synagogue is located in Kibbutz Hefzi-Ba at the foot of Mt. Gilboa. 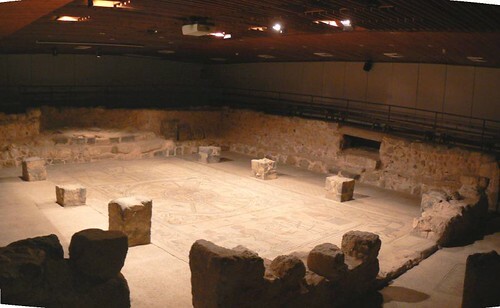 The synagogue was constructed in the fifth century A.D. It had a courtyard, an entryway, a large rectangular room, a second-floor balcony, and an additional room. Additional buildings surrounding the synagogue were discovered (but can’t seen today). The synagogue is aligned to the south-west, facing Jerusalem. 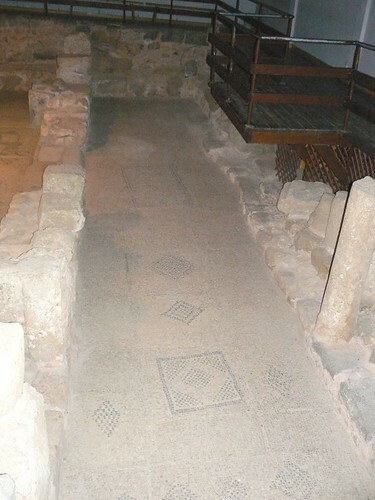 Two inscriptions were found on the entryway floor. 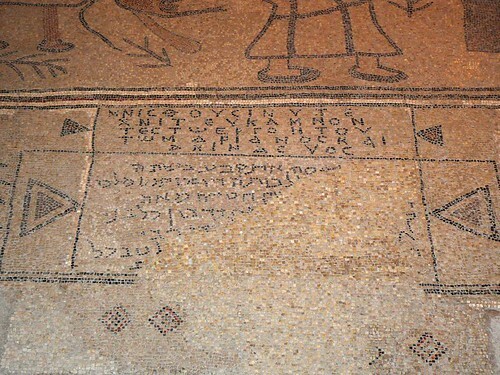 The Aramaic inscription states that the mosaic was made at the time of Justin (apparently Justin I, who ruled from 518 to 527); the Greek inscription is in memory of the artists who made the mosaic, Marianus and his son Hanina. 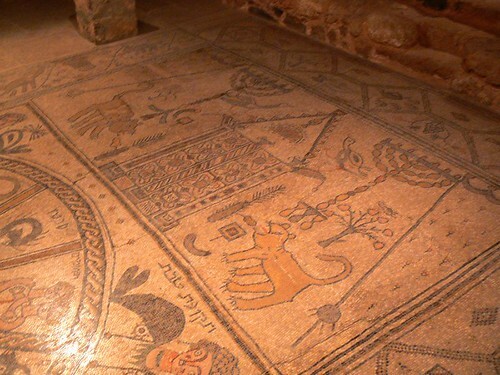 The piece de resistance is the mosaic floor in the central room, one of the most important mosaics discovered in Israel. 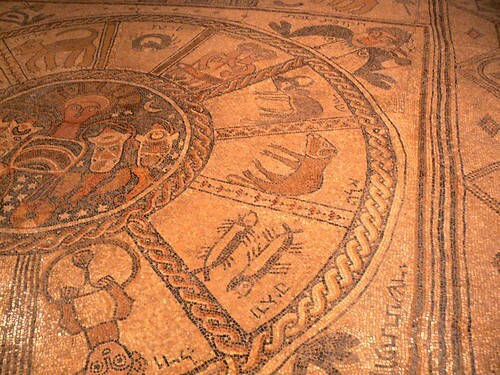 Each of its three panels depicts a scene – the Holy Ark, the zodiac, and the story of the sacrifice of Isaac. The zodiac has the names of the twelve signs in Hebrew. 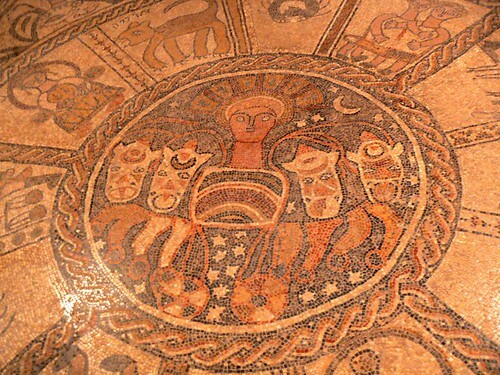 In the center is Helios, the sun god, being whisked away in his chariot by four galloping horses. 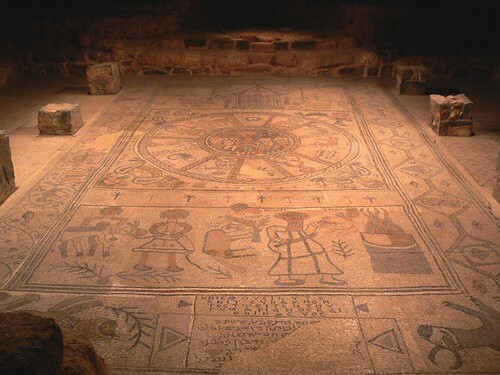 The four women in the corners of the mosaic represent the four seasons. The most touching scene is, of course, that of a bearded Abraham preparing to sacrifice his bound son Isaac.